Steve Jobs used to rehearse, rehearse, rehearse before a presentation. Every moment of the event was choreographed, every word picked with purpose. Elon Musk does not do this. He wings it. 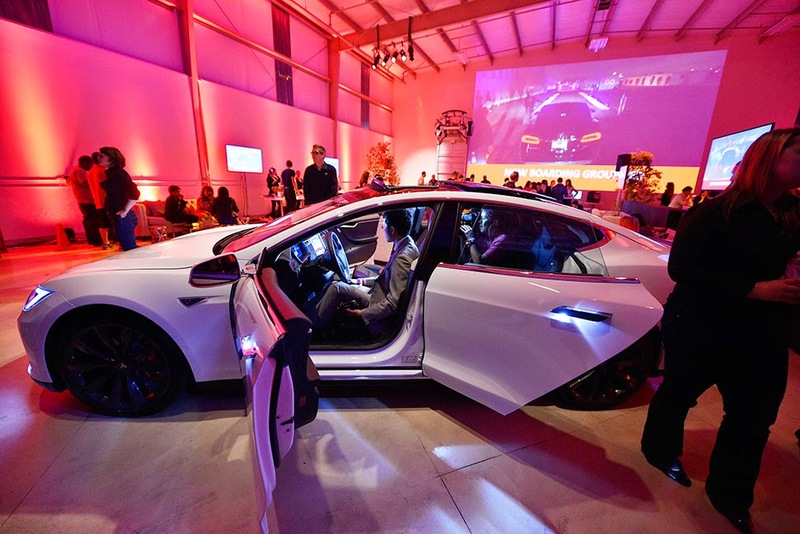 On Thursday night, the chief executive officer of Tesla Motors (TSLA) unveiled a new version of the Model S all-electric sedan at an event in Los Angeles. The short of it is that the car is amazing. It has two motors—one in the front, one in the back—and all-wheel drive. It’s a sedan that can go 0 to 60 in 3.2 seconds. A sedan. 3.2 seconds. “This car is nuts,” Musk said. “It’s like taking off from a carrier deck. It’s just bananas.” The car gets 275 miles of range and has a top speed of 155 mph, up from 265 miles of range and 130 mph. Shipments of the car begin in February. 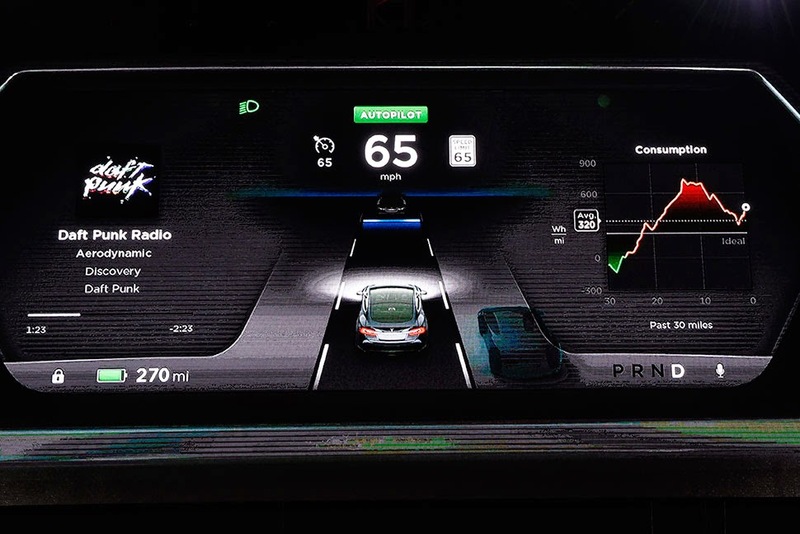 On top of all this, Musk revealed that Tesla has already equipped the most recent cars coming off its assembly line with autopilot technology. There’s radar to sense and avoid objects. And Tesla has tied its GPS into the system to let some interesting things happen today and some amazing things happen in the future. The 'D' is the faster and all-wheel-drive version of the Model S electric sedan, capable of accelerating to 60 miles per hour in just over 3 seconds. The technology was certainly impressive, but so too was Musk’s performance and the event itself. Thousands of people showed up at the Hawthorne Airport in Los Angeles, and Tesla turned the area around the runway into a giant bar. The whole thing felt more like a concert than a product unveiling. People with cocktails banged into each other as they fought for more than an hour to get closer to the stage. When he first appeared, the audience erupted in cheers and people held their smartphones in the air to get photos. I’ve seen just about every major tech CEO of the last 20 years speak, and the closest comparison to this scene would be when Jobs talked. Musk has developed a loyal, rabid fan base, and it’s growing. Early in his career Musk struggled during public presentations or at least appeared a bit awkward. He’s more engineer than showman and has the delivery to match. While Jobs had the time and inclination to polish speeches, Musk has no such luxury—he’s running both Tesla and SpaceX full-time—and just generally cares less about massaging the moment. Musk just hops on stage and says what comes to mind. 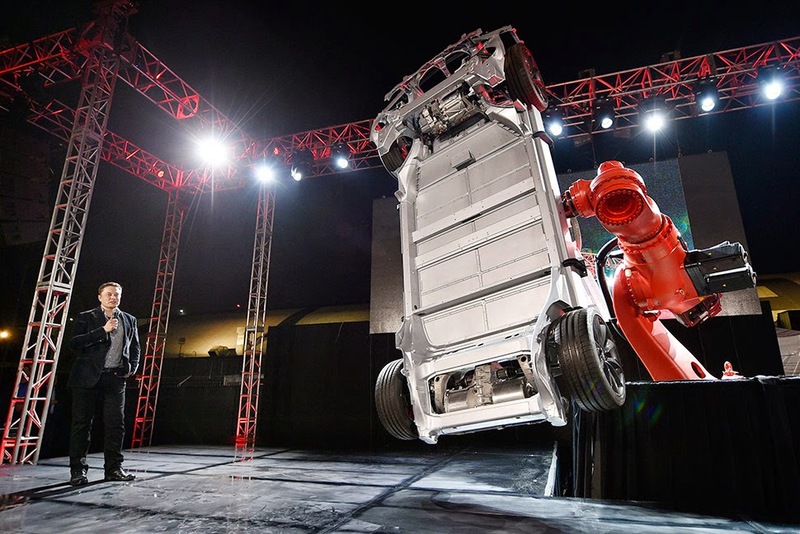 A few moments later, Musk brought the new Model S chassis on stage via a giant robotic red arm—“Release the titan”—and pumping music. The arm made picking up this huge chunk of metal look effortless, as it waved the car’s body up and down and left and right and in circles. “Robots,” Musk said, and then let out a master-of-the-universe smirk. Musk, dressed in a long black leather jacket, pointed to the airport’s runway and said that everyone at the event could test drive the new car. People then lined up by the hundreds, got in the cars and sped through a lighted tunnel. Tesla had never before put on this type of event. The substance of what Tesla revealed lived up to the show. 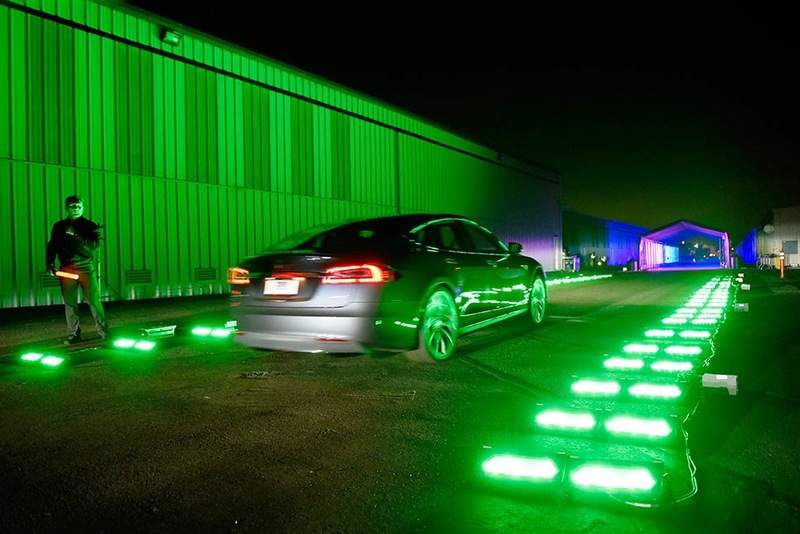 Because of Tesla’s electric drivetrain, the company can make the most out of its motors. Instructions sent out by the car’s computer do not have to travel through mechanical systems. They’re sent instantly to the wheels. “It’s like the equivalent of analog to digital,” Musk said. This means that the car can deliver commands about how to take a corner, how to shift power from the front of the car to the rear, and how to tweak the car’s torque in milliseconds. If Tesla wants, it can have one motor be tuned for city driving, and the other motor tuned for highway driving. It’s through the software and this clever programming that the new car actually gets more range than its predecessor despite the added weight of a second motor. This is another example of Musk’s quest to make not a “good enough” electric car but to make electric cars superior to internal combustion vehicles. The major downside, of course, is that these cars remain very expensive. The Model S already costs a small fortune and adding a second motor will bring the price tag up another $14,600. Tesla’s next car is the Model X, an SUV due out early next year that will be similar in cost to the Model S. So the public is still at least a couple years away from the Model E, a car in the $35,000 range.